Digital State is one of the 7 Pillars of the Next Leap Forward for Digital India. Without the states embracing digital to function and to serve their citizens, Digital India dream cannot be realized. But what exactly is a Digital State? Is there a perfect model that can inspire and guide the state leadership to act? We present our perspectives here. Before we delve into answering these questions, let us understand the journey that a state would have traveled in the Indian context, before it evolves into a Model Digital State. Their evolution can be traced over four distinct waves. Wave 1 – Basic Infrastructure like personal computers, printer, LAN or WAN to link intra or inter locations, and email software. Mostly focused on enhancing the personal productivity of the staff. The role of the centre has been to provide the skills and knowhow, mostly hardware centric, to build and run the infrastructure. Wave 2- Client Server based domain applications, mostly in the finance and accounts, personal management and general administration. One will be surprised to know that some states are still on this wave. The role of the centre has been to create core applications, which can then be customized and implemented by different states. Some states also built on their on. The applications were difficult to implement manage, and scale. However, that was the best they could do with the existing technologies of those times. Wave 3 – Web Applications that could be hosted in cloud, promoting centralized management, standardized workflows, broader reach, larger scale, and access on multiple form factors. The broader IT, internet and telecom infrastructure are also evolving to support the new architecture of the web applications. Most of the leading states* are in this phase, yet with different experiences. Emerging and promising states have partially entered this phase. The Lagging states are yet to enter this phase. Supportive policy and infrastructure readiness are reasonably high in the leading, still being defined in emerging and promising, while missing in the lagging states. The push by centre in the form of mission mode projects is being exploited holistically by the leading and emerging states, sporadically by the promising and the lagging digital states. Wave 4 – A Data First Paradigm that has an integrated cross domain platform that can generate, store, manage and analyse data of high volume, velocity and variety, which can be referred to as high data capacity. It involves exploiting the new digital technologies evolving in distinct waves. A supportive data policy for collecting, sharing and using personal data of the citizens and businesses for creating new experiences and participation. A DIGITAL STATE is a construct of governance that approaches digital holistically towards creating a conducive environment, multi-faceted development, and inclusive growth. The construct spans across Digital Policy, Digital Infrastructure and Digital Programs across domains of governance. 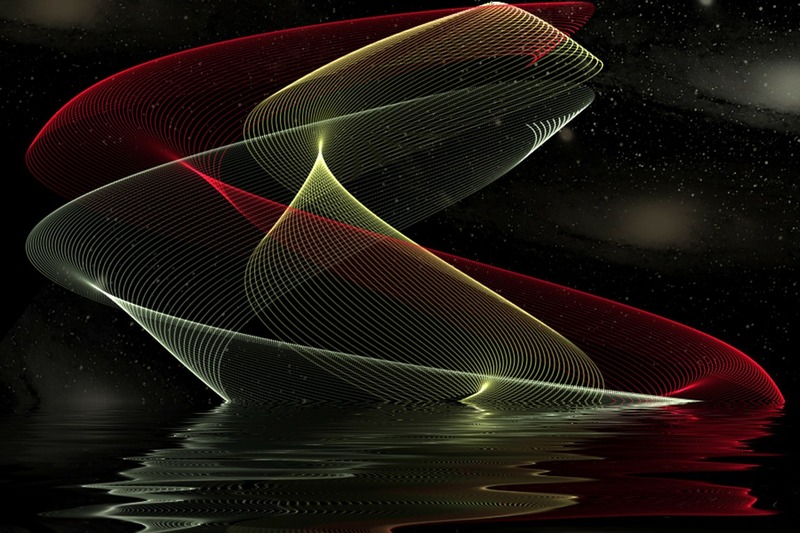 Along with the third and fourth digital waves, the contours of a Model Digital State start emerging. A conscious effort shall help a state emerge as a Model Digital State. 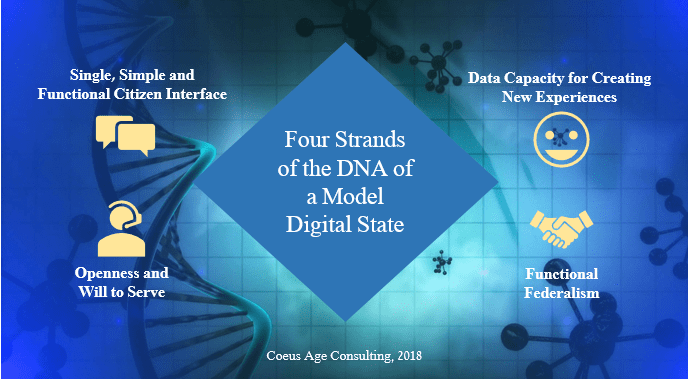 A Model Digital State would evolve into a new paradigm of governance characterized by a DNA with four distinct strands. #1. Single, Simple and Functional Citizen Interface– even if governments are willing to work, they may be failing due to the complexities they have inherited in legacy. Multiple organizations may be involved lacking proper integration, or manual processes and lack of transparency may be the rule. Model Digital States are characterized by simple interfaces for citizens that resolve or subsume the complexities behind them. The simplicity of interface also means that there is a single interface for interacting with government for anything and everything. Citizen Experience is at the core for Model Digital States, which is measured in terms of citizens’ feedback and not only as process metrics as widely done today. #2. Openness and Will to Serve – so what’s new about that? Are governments not supposed to be that way? Well, in promises they remain so but in reality, many are not so open and ready to serve. I have seen many governments, where finding a department’s contact extremely tiring and sometimes impossible. The telephone numbers published on the web site either do not work or are never responded to. Many citizens do now know where to register a complaint regarding local park’s encroachment or garbage removal and whether some action is being taken by the authorities involved. Model Digital States are open and willing to serve, there exists a commitment towards providing good governance, in spirit not just in letters. They run governments that are available to the citizens. #3. Data Capacity for Creating Experiences– existence of policy, structures and technologies for collecting, storing, managing and analysing exponentially growing piles of data is a hallmark of a Model Digital State. Model Digital States display the readiness to share data, involve external entities to meaningfully use the data and roll out better services, and strive for new data based experiences. #4. Functional Federalism – I urge that this is not read from a limited lens of political compatibility but seen more from the state’ will and capability to align with the central schemes and resource allocation for the benefit of the individual state. In an increasingly connected world, where global citizens have become a reality, the geographical and political boundaries must be digitally transcended. The centre and the state must work together for the benefit of the citizens, leveraging the integrated programs, common architectures, policy frameworks and standardized processes. Two things become very clear. One, a Model Digital State is not just about Digital, rather it is also about leadership commitment, a conducive policy environment and enabling structures. And two, a Model Digital State is not a destination, but a journey that moves toward achieving an ideal. The ideal will also evolve with evolution in technology, governance experience and citizen expectations. As one move towards perfection, newer standards of perfection shall evolve. We would love to know your perspectives. We can be reached at kds@kdsnext.com. * For understanding the nomenclature of Leading, Emerging, Promising and Lagging Digital States, check the article.